Many elderly people are left without proper palliative care and end up dying undignified deaths, a survey suggests. 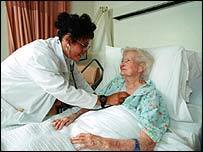 Half of 800 health workers polled for Help the Aged said there were no end-of -life policies at their places of work. Some 57% said they lacked training and support, and a quarter said they struggled to cope with dying patients. The research comes as the Department of Health says 60% of hospitals and a quarter of GPs are following best practice in end-of-life care. In 2003 the government announced it was investing £12m over three years in its End-of-Life Care Programme, which was designed to provide better training to health professionals. The programme aimed to reduce the emergency hospital admissions that prevent many elderly people from dying at home as they wish. It also asked trusts to introduce a raft of new practices to improve services. But two thirds of health professionals quizzed in the Health Service Journal and the Nursing Times for Help the Aged said the care given to elderly patients with cancer, heart disease or dementia was much worse than the care given to younger patients with similar conditions. Some 69% admitted that many conditions suffered by the elderly, such as dementia, arthritis and sensory impairment, were overlooked. And half said access to palliative care was worse for the elderly. Director of policy at Help the Aged Paul Cann said: "Too often, the idea that people 'die from old age' means that they are not receiving the care and support they need." He added: "Front-line staff are working under much pressure, often with little training and support, making it near impossible to dedicate the quality of care so needed by older, dying patients. "The resounding message from many older people facing death is that they want to be treated as individual human beings, with emotions, feelings and spiritual needs, not as a machine that needs fixing." He said the charity wanted to see equity in healthcare and an end to inherent discriminatory assumptions that just because a patient is old, then death is inevitable, and therefore not worth time and concern. Help the Aged called for more training and support for health and social care staff and for health authorities to assess the palliative care services that they provide in hospitals, hospices, care homes and in people's own homes. It also called for more information to be made available to help inform older people of the support they could expect at the end of their lives. The Department of Health says in a new report on its end of life care that it is making progress. At the end of 2005 - 12 months after the advice was launched - 60% of hospitals, 28% of GPs and 47% of hospices had introduced the relevant guidance. But only 1% of care homes had done so. Professor Ian Philip, national director for older people, said: "The report highlights excellent progress in rolling out best practice care and training models to GPs, hospitals, hospices and care homes." But he added: "There is still a long way to go before all staff are trained and all patients benefit."